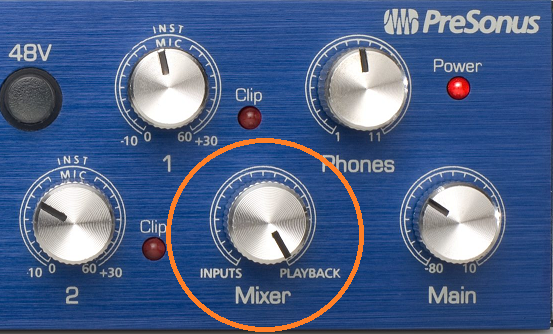 If the knob is turned to inputs, one would only hear what is being played into the device; if the knob is turned to playback, one would hear only what is coming from the computer. If the knob is set in an intermediary position, one would hear both. Sometimes, if the knob is placed in an intermediary position, this can cause a "chorusing" or "flanging" effect, or even an effect as drastic as a slap-back delay. This is because it takes time for the audio to be processed by the computer, whereas the direct monitor bypasses the computer. Because of this delay, one of the signals is slightly (in the order of milliseconds) behind the direct input monitor, creating this "doubling" phenomena. To resolve this issue, either disable monitoring from within your software and monitor directly, or turn the knob all the way to "playback" and monitor only from the DAW. Why am I not able to hear and record the imported/dragged instrumental format when i press the record button?